Your hotel guests are a vital element in the success of any energy and water efficiency strategy. If you engage with them effectively then your costs should fall and they will feel a stronger sense of loyalty to your positive brand. What’s more, this is a highly cost-effective means of managing energy and water use with minimum outlay in terms of cash and time. How Can I get My Guests to Use Less Energy? Let them know you care: Caring for the environment is high on most people’s list of daily actions so you can only win by telling your guests about your programme to reduce energy and water consumption for the sake of the planet. Tell them they can make a difference: Guests will, in the main, feel very positive when hearing about the ways that you are making a difference through your eco policies and will want to know how they can help. Show them the way: Giving guests some simple pointers for effective and easy actions will encourage them to act. There’s a strong feelgood factor for guests in knowing that during their stay they have minimised their effect on the environment. For Step 1, it’s important to inform guests about your environmental policies. They won’t appreciate being bombarded with lengthy screeds of information but would usually be interested in the main points. You can place the hotel in context by sharing key points about how much energy and water is consumed annually in your hotel and in which areas. This can be reinforced by overall sector information. For example, some figures suggest that the hotel sector consumes 97.5 TWh of energy annually across the globe. This can then be tied in with the objectives for your environmental strategy and the reasons for choosing the main areas to work on. 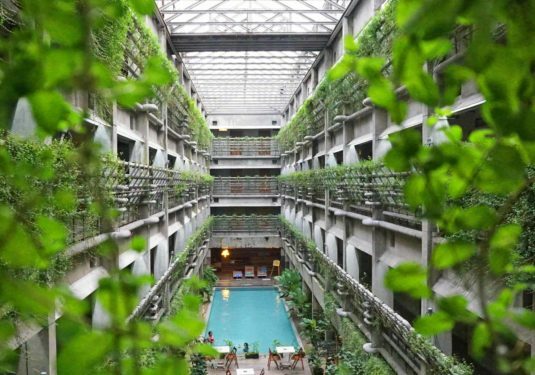 It is important to be explicit in saying that your hotel is actively reducing its greenhouse gas emissions and carbon footprint in general, while seeking to conserve the planet’s natural resources. Reinforce this positive message by sharing information on any ways that your hotel is allocating savings for further eco measures as well as improving services for guests. For Step 2, there are a range of ways to engage with your guests to let them know how they can make a difference. You can give them a fact sheet when they arrive or have it displayed in their rooms. And make sure your eco policy is prominent on your website. On that last point, the savings potential in reusing towels is impressive. For instance, the American Hotel and Lodging Association estimates that this reduces the total number of laundry loads by 17 per cent, with savings on water, sewerage, energy and labour costs. Further eco benefits and lower costs come from less demand for towel replacement with longer lifespan. It’s important, though, to make sure that your hotel says the right thing as well as doing good for the planet. Guests exposed to the social norm sign reused towels at a significantly higher rate than those with the standard sign. A second experiment where the signs referred to guests in the specific room number, rather than other hotel guests in general, was an even stronger motivator to reuse towels. The research has been replicated by the University of Luxembourg in a study of European alpine resorts and the improved messaging adopted in US hotels. So, a combination of messages that emphasise environmental impact together with an appeal to social norms (we want to do positive things as others do) makes all the difference in engaging your hotel guests with your environmental policy. And it’s always good to ask your guests for suggestions on how to improve eco policy with other feedback. The annual savings potential from active guest participation in energy and water-saving policies in your hotel could be 10 per cent or more, with minimal costs.